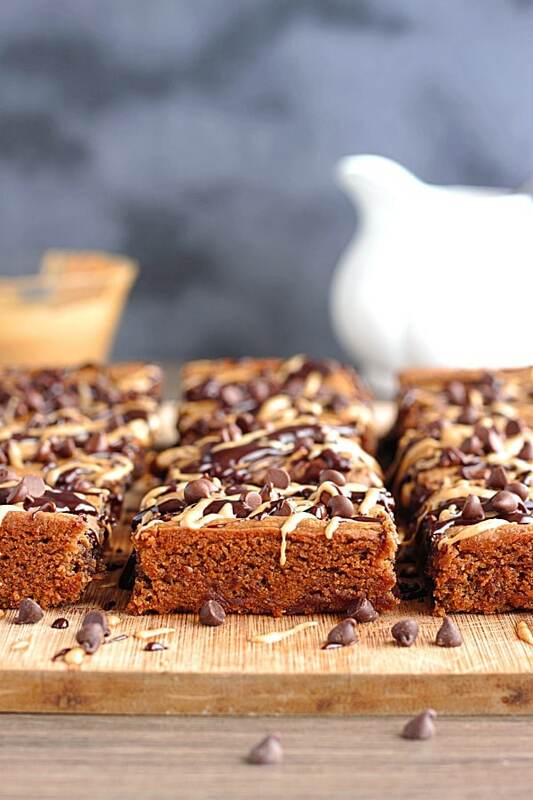 This chickpea blondie recipe is fudgy, irresistible and so decadent! I love using beans in my brownies/blondies because they make the texture super moist and chewy, but still sturdy so they don’t crumble. Not to mention the added protein and fiber! 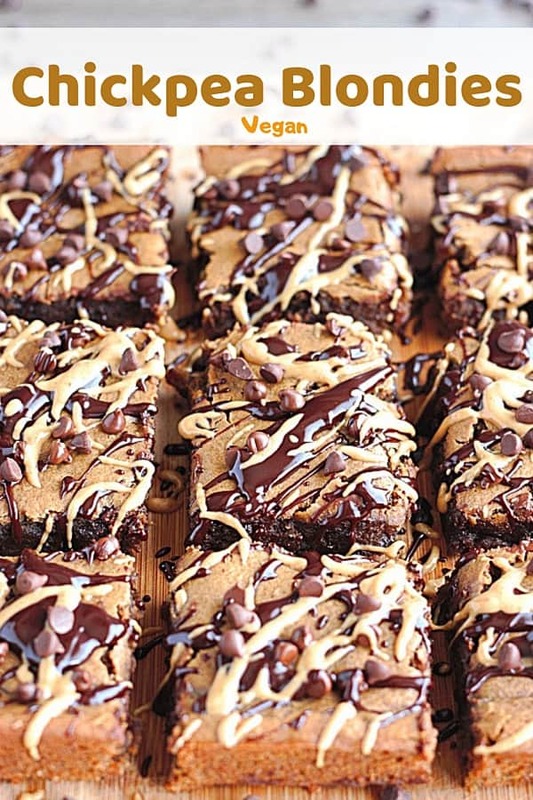 Finally, these are topped with extra chocolate chips, creamy peanut butter and chocolate drizzle! 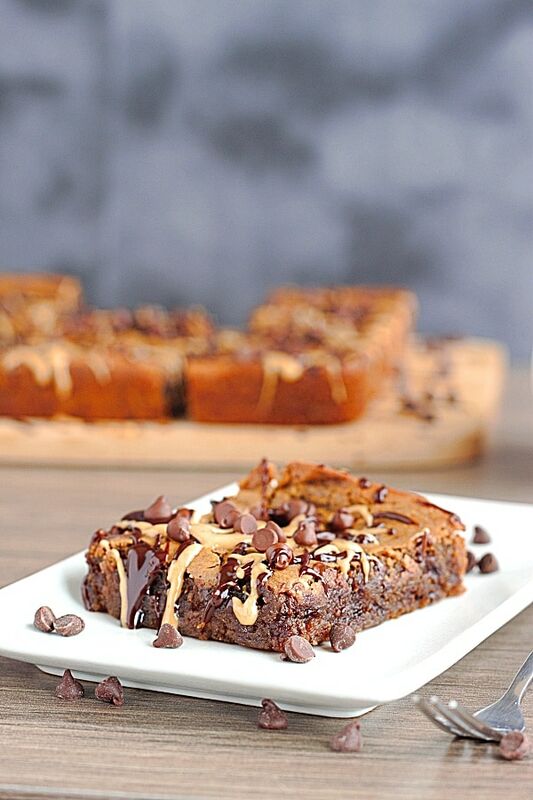 These would be even more amazing with some Chocolaty Banana Ice Cream on top! The inside is a bit darker than the top, but I did add a good bit of chocolate chips to the batter, and the coconut sugar also darkens them compared to refined white sugar. 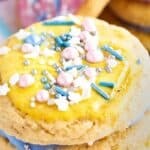 I made these a few different ways, experimenting with more cakey or fudgy versions, and the fudgy definitely won. If you like more cakey blondies, simply don’t add the almond milk in the recipe, and add 1/4 tsp more baking powder! 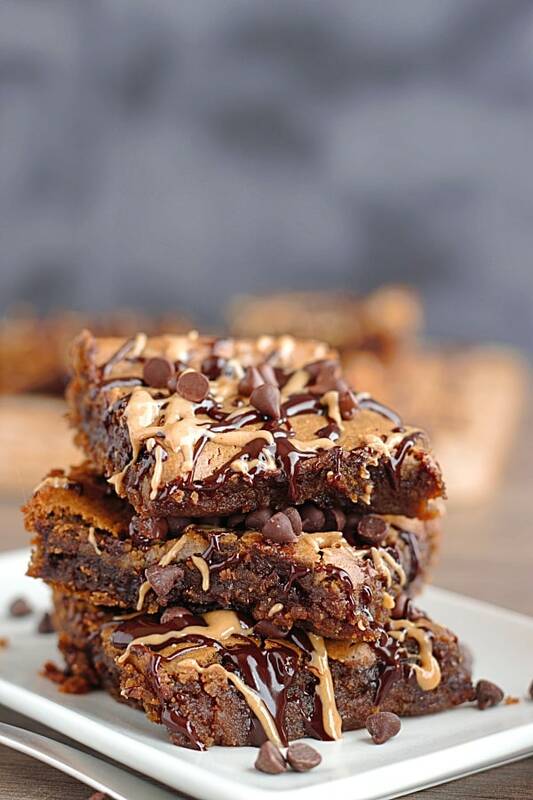 Not only are these blondies unbelievably delicious, the batter can be made in a blender or food processor! Seriously, just add all the ingredients (except the chocolate chips) to your blender of choice, and process until smooth. Then, stir in the chocolate chips (however many you’d like), and pour into an oiled or parchment paper-covered 8×8 baking dish. Bake them for 30-35 minutes, or until a toothpick comes out clean when inserted into the middle of the dish. You’ll know when they are getting close when they start turning a golden brown color. To make the incredible topping, just heat up all-natural peanut butter and some leftover chocolate chips in separate bowls. If you’re using a microwave like I did, heat them in 10 second increments and stir in between to avoid burning. Now the fun part! 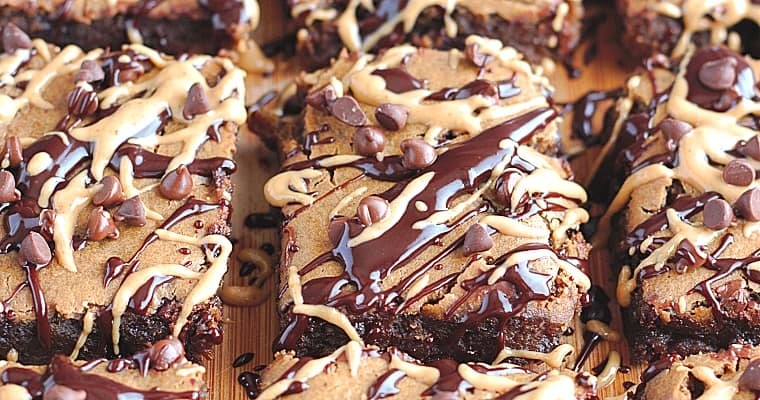 Dip a knife or spoon in the sauce and shake it all over the blondies to coat them! Repeat with the other sauce and top with extra chocolate chips to go all out. I would recommend letting them cool completely before trying to cut them out, otherwise they may be a bit crumbly. 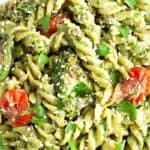 I like to store leftovers in the fridge as well which helps them stay more dense and tasty! 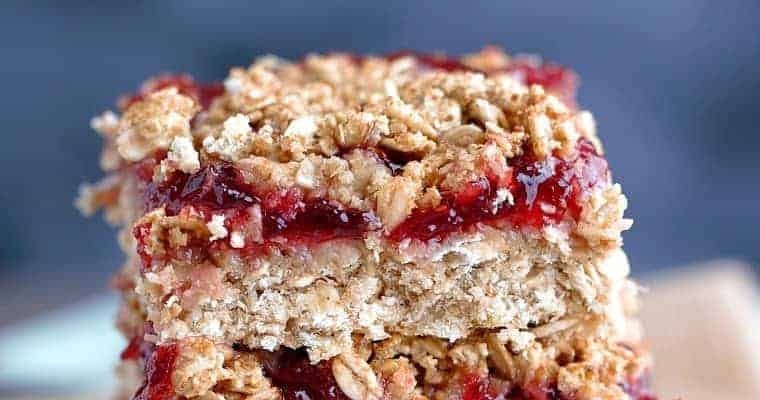 These blondies are sure to impress vegans and non-vegans alike! I’ll bet they won’t even know the difference, and will be shocked to find out they are mostly made of beans! 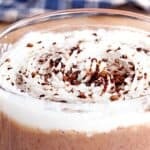 There really is no better combination than chocolate and peanut butter, and now you can enjoy this healthier version without sacrificing on taste! Lightly oil a 8x pan or add parchment paper to avoid sticking. Pour in batter and level it out. Bake for 30-35 minutes until light golden brown and a toothpick inserted into the middle of the dish comes out clean. Heat up peanut butter and chocolate separately in the microwave, stirring every 10 seconds until runny. 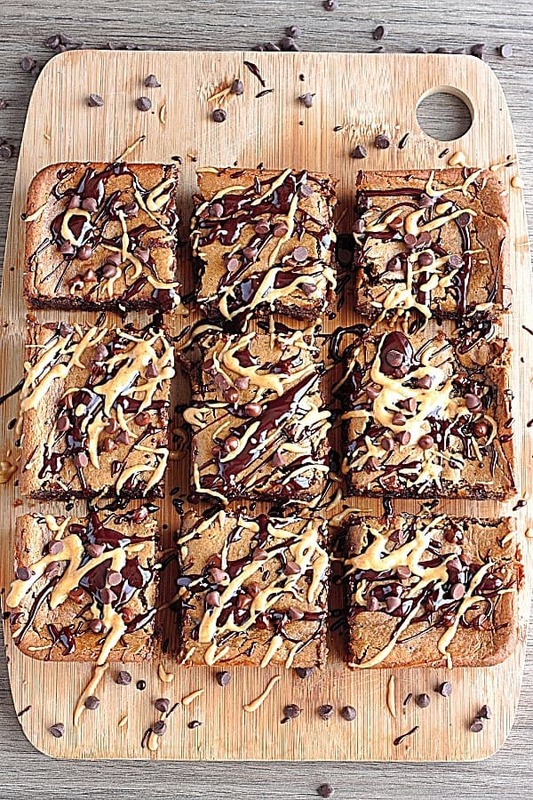 Drizzle over blondies by dipping a knife into the chocolate sauce and shaking it to make a zig-zag patter, repeat with peanut butter. Allow to cool to avoid breaking, and enjoy! Thank you so much! Yes, you can definitely feel better about indulging or having a second piece! I’ve been cutting back on calories and desserts. 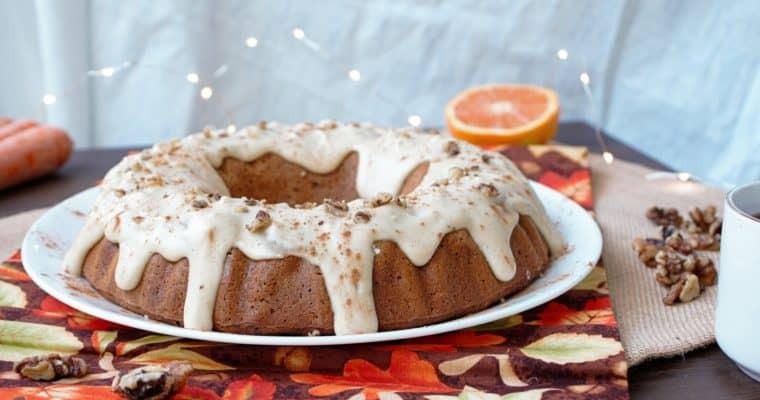 This recipe is a great way to enjoy some wholesome indulgence! 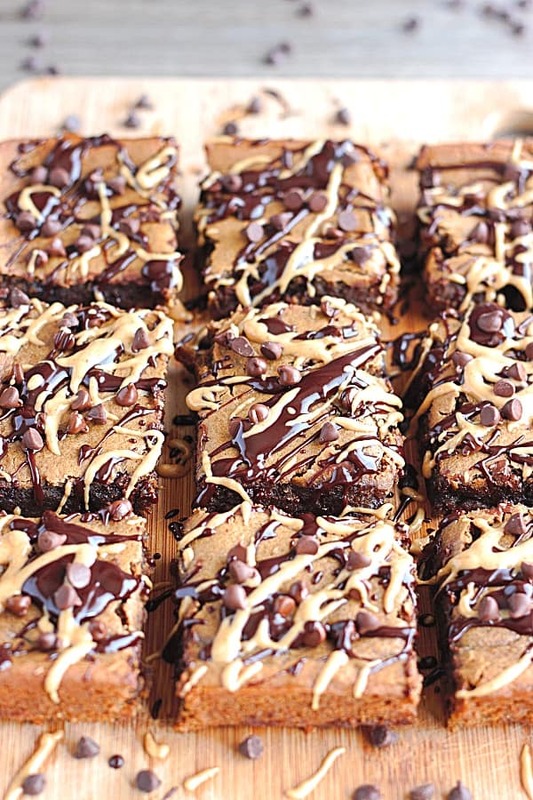 I really have to try these, I’ve been intrigued by brownies and blondies made with pulses for a while. These look fabulous. Sharing them now! Thank you so much! 🙂 Let me know how you like them! Thank you! 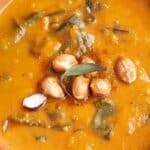 🙂 I love simple swap-outs to make healthier recipes! 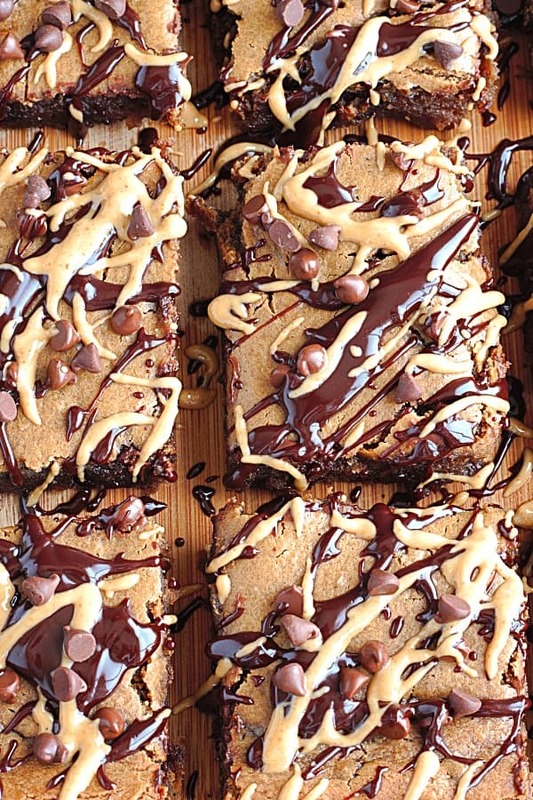 These blondies look amazing, but honestly, I am not a big peanut better fan. Can I substitute almond better instead?